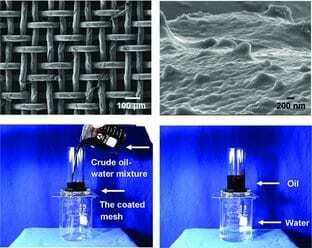 A steel mesh with a porous hydrogel layer is both superoleophobic and superhydrophilic, allowing water to drain while retaining oil. Researchers have developed a material that can quickly and efficiently separate oil from water, in what could be a major boon for environmental cleanup. By coating a stainless steel mesh with a porous polyacrylamide hydrogel layer, Prof. Lei Jiang and his team at ICCAS, Beijing have created a simultaneously superoleophobic and superhydrophilic material that can be used as a filter that can separate oil from water.